The Quill ergonomic vertical mouse is very comfortable to use. It feels natural in your hand. A lot of research went into this ergonomic mouse and it has paid off. The VHF Mousing System is a "Bundle" of E-Quill-AirO2Bic Mouse & E-Quill-Liberator Clickless Software which can be specified PC or Mac. Complete vertical mouse system. Designer Appliance Products are designed to allow users to work in a position that Ergonomists and Therapists call 'Functional Neutral'. This is a position in which you are able to work while in a 'Neutral' or near resting posture. Limbs that are comfy tend not to ache and if people don't ache they are less likely to injure! It is Universally Assistive Technology as, by removing the circumstances that can create hand disability, it removes the limitations that mousing creates in those with disabilities. It is also the first ergonomic mouse product that removes the "design stigma" that other products for disability create and requires the same simple installation and is as easy to use as any other mouse, though requires no other specialized equipment for your PC. It delivers the same level of protection from further injury for those with disabilities as it does for the able bodied and is the only conventional mousing system that can be claimed as being compliant with subsection 1194.26 of Section 508 of the US Governments 1998 amendments to the Rehabilitation Act. E-Quill-Liberator Clickless Software automatically performs 95% (Average Word Processing User) of button clicking operations for you with visual indications of activity at the cursor so you are always looking at the working part of your screen. 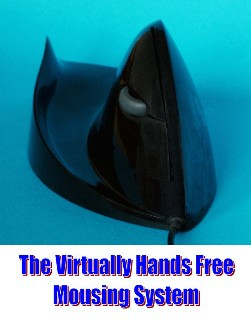 It provides for Virtually Hands Free mousing by being both Grip & Click-Less. 5,000 + finger clicks events per day are typically reduced to only a few hundred. It is optimized for Word Processing Applications and Web Browsing. You can surf all day and not have to click a button. It has a built in and user definable break timer with 'Add Back'. If you take an unscheduled break to answer the phone, it adds back time until the next Nib break so as to reduces your risk of injury and not your productivity. You can also choose to turn off your keyboard and mouse during the Nib Break making a positive commitment to performing the stretches that help increase your body's oxygen levels or just get up and walk around. It tells you how many clicks it performs for you and how many you do for yourself, proving feedback that helps you get to know the system better. Once you purchase a VHF system you need to register on the Quill website, log your Software Key Serial Number (that you will receive by email) and then you can download whenever you want to or when you are notified of Quill's 'free for life' updates. We strongly suggest that you add a Quill-Well Mouse Mat to your order; when you try it you will notice immediately how much easier mousing is compared to using other mice and mouse mats. You can choose left or right handed models in either onyx(black) or pearl (white). Windows 95, 98, Me, NT 4.0, 2000, XP, Vista, win 7, windows 8, and windows 10 and Mac 9.X and up.